This is likely the last short sleeve shirt I'll make for a client this season! 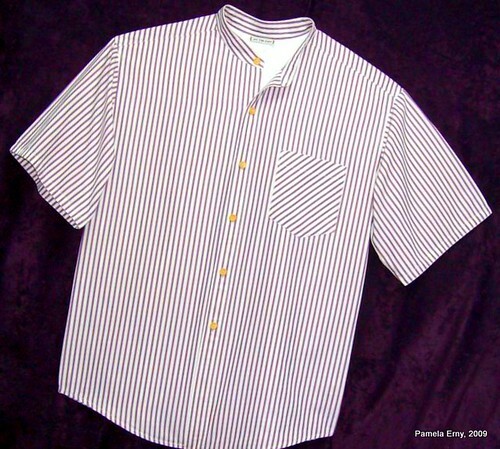 This shirt features a lined bias pocket and a bias back yoke. As you can see in the photo below, the client also requested a CB "Locker Loop" that I made a bit more interesting by tying a knot in the center. I found that I needed to line the pocket of this shirt. 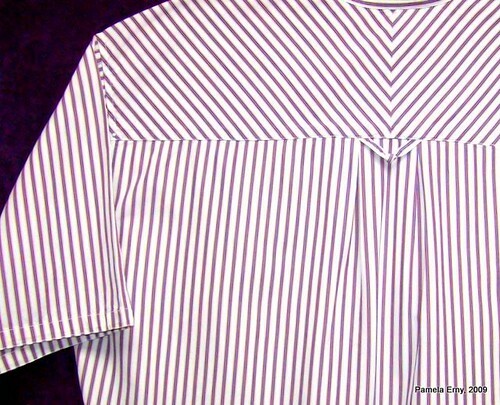 The fabric is very lightweight, and the vertical stripes of the shirt-front clearly showed though the bias stripes of the first unlined pocket I made. Since a seamed lining on a pocket crafted from fine cotton will show ugly ridges when pressed, I prefer to line a shirt pocket without seams. First, prepare the pocket by pressing all edges into their finished position, but do not stitch the pocket hem...yet. Then, cut a lining from lightweight fabric that is the exact size and shape of the finished pocket. I used Pro-Woven Standard Interfacing #1 Lightweight. Next, just tuck the pocket lining into (under) all the pressed folds of the pocket. The photo below shows all but one side of the lining inserted into the pocket. 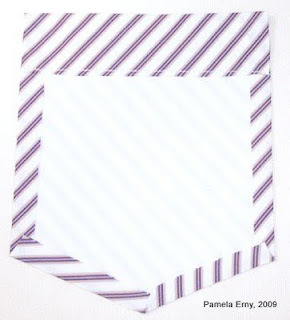 After all the edges of the pocket lining are tucked into the folds of the pocket, and the lining is flat and smooth, stitch the pocket hem as shown below. 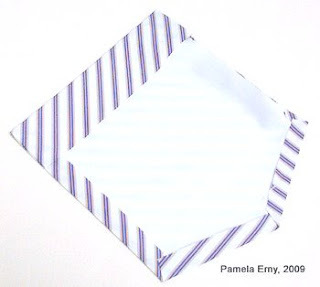 Now you are ready to stitch the pocket onto the shirt...where your top-stitching or edge-stitching will "auto-magically" secure the remaining edges of the lining. These heat transfers are just too much fun! I made this a few days ago for my niece Willow. Starting with a simple tank-top pattern, I ran a line of hand stitching across one "strap", gathered it, and then secured the stitching on the wrong side. Of course, this was done after the transfer was applied. 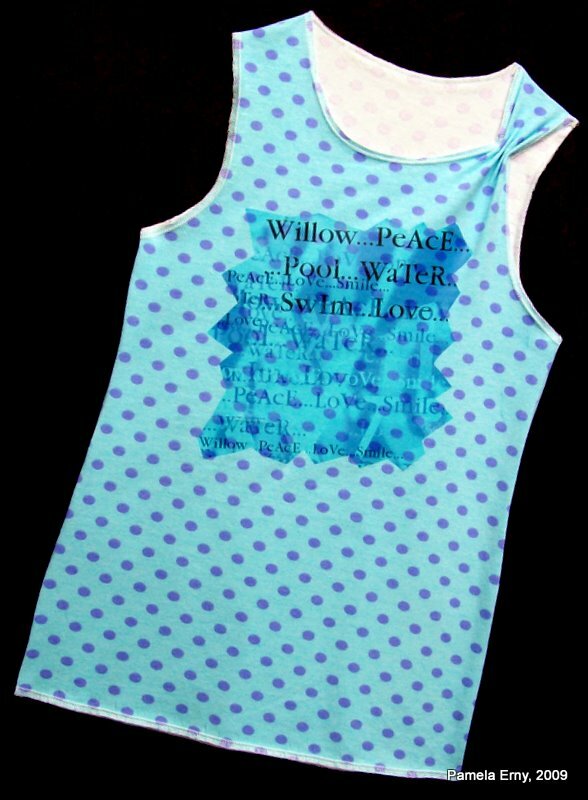 The transfer graphic was rendered at www.typogenerator.net from a melange of words.."Willow, Peace, Swim, Water, Love, Smile"
I printed it onto a sheet of T-Shirt Transfer Paper that you can get at office supply or craft stores, and applied it according to the directions. I haven't seen my nieces in several months...but tomorrow my sister, her husband, and the girls are coming for a visit. I am so excited about seeing them...I sure hope that they like their new tops!